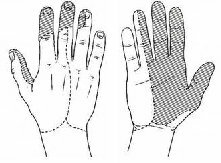 Carpal tunnel syndrome is the result of compression of a large nerve (the median nerve) as it passes through a tunnel (the carpal tunnel) at the wrist ( figure 1 ). It is one of the most common conditions affecting the hand and fortunately it is amenable to treatment. 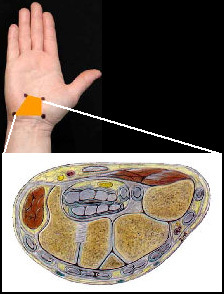 The median nerve provides feeling in most of the hand (not the little finger - figure 2 ), and the muscles at the base of the thumb. In carpal tunnel syndrome there are a number of characteristic symptoms. These are usually worse when the wrist is flexed, such as when reading the newspaper or driving a car. The symptoms are often worse at night waking up with a numb painful hand. Hanging the hand out of the bed or shaking it can relieve the symptoms. Some patients experience generalised pain in the hand and forearm whilst others complain that their hand feels swollen. The hand may feel weak, especially during activities requiring pinch grip using the thumb, such as opening jars or bottle tops. Dropping objects is a common complaint. Some patients find that they are unable to feel things properly with their fingers, and they find it difficult to recognise small objects, such as coins. Doing up buttons may be difficult. In the early stages of the condition these symptoms are usually intermittent and reversible. Later the altered feeling and numbness can become permanent and there may be loss of the muscles at the base of the thumb. This is best avoided by early treatment as these changes may be permanent. There are recognised causes of carpal tunnel syndrome, such as rheumatoid arthritis, thyroid disease, diabetes mellitus, inflammatory arthritis and pregnancy. However, in most people no cause is identified. Carpal tunnel syndrome is more common in women and it often affects both hands. Non-surgical treatment using wrist splints, activity modification or a steroid injection into the carpal tunnel are all described. The amount and duration of symptom improvement after a steroid injection can be difficult to predict. It has the advantage of being a minor procedure that can be performed at the time of your consultation. There is a small risk of directly injecting into the nerve with this treatment. Surgical treatment involves the release of the carpal tunnel (a carpal tunnel decompression ) and it is one of the commonest hand operations performed. It is a relatively minor operation which is performed using local anaesthesia as a day case. The flexor retinaculum, which is the ligament that forms the roof of the carpal tunnel, is released thus decompressing the carpal tunnel. On average the operation takes approximately 10 minutes and it is not usually painful. Post operatively you will have a bulky bandage on your hand and wrist for up to 2 weeks and the hand will need to be elevated for several days. The operation is usually well tolerated and it usually has a predictable outcome, the symptoms resolving completely in most patients. Complications are uncommon and usually minor. Postoperative scar tenderness is the most common experienced, and whilst a nuisance, it usually resolves completely. 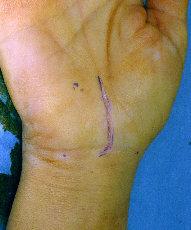 Wound infection is seen in up to 1% of cases and injury to the median nerve has been described, but this rare. Muscle wasting is usually permanent and it does not recover.